As tough as it is to admit, chimpanzees are just better at some things than humans are. Scientists have previously revealed that our closest ape cousins beat us handily at short-term memory skills. Now, researchers report that chimps are also better than humans in simple contests based on game theory—a form of mathematics that deals with figuring out the best strategy when faced with a competitive situation. 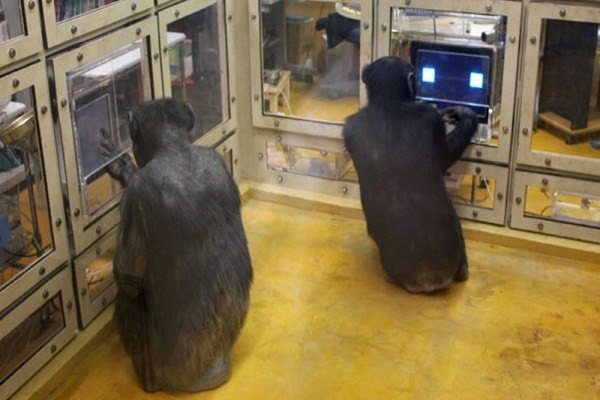 In the current study, published this week in Scientific Reports, chimpanzees at the Kyoto University Primate Research Institute in Japan played a hide-and-seek computer game (as in the photo above; video here). Undergraduate students and West African villagers also competed separately; no speaking was allowed. Both human and ape gamesters sat facing away from each other; their job was to predict their opponent’s move. Chimpanzee winners were rewarded with apple cubes, while humans were given money. Game theorists have determined that there’s a limit to how often the game can be won—even if both players are making the best possible strategic moves. That limit is called the Nash equilibrium, after the Nobel Prize–winning mathematician John Forbes Nash Jr. The chimpanzees trumped the humans. They learned the game faster than their human counterparts and performed in line with the Nash equilibrium—hitting the theoretical benchmark. Chimpanzees, the researchers say, may be particularly good at the game because of their excellent short-term memories and talents for pattern recognition and rapid visual assessment. In the wild, the apes are also highly competitive, vying for dominance. Humans, on the other hand, are more cooperative.